I've been off work and away on vacation this past week. 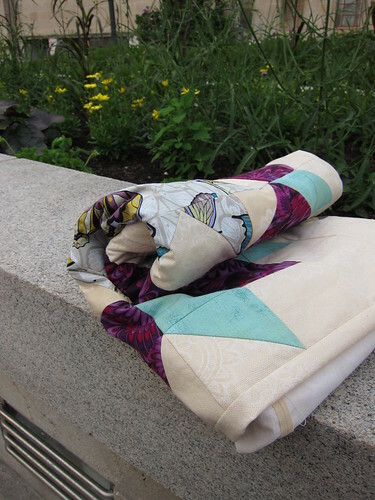 After some quick negotiating with my significant other, I packed my sewing machine and the fabric for my Swoon quilt. Since I'm generally an early riser, I was able to spend most of my mornings sewing while my Mr. slept in. 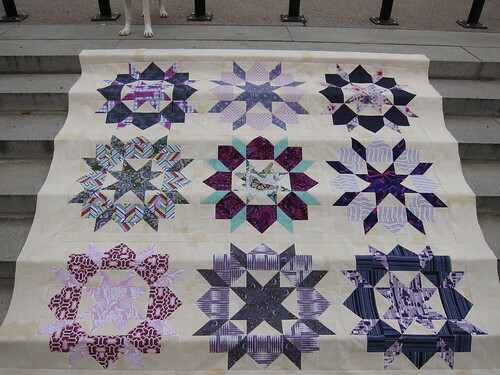 I finished up the last four blocks and pieced them all together into a finished quilt top. Vacation weeks are the best for making big progress fast! Here are blocks 6, 7, 8 and 9. I found it very difficult to settle on a final layout and spent days agonizing over it. 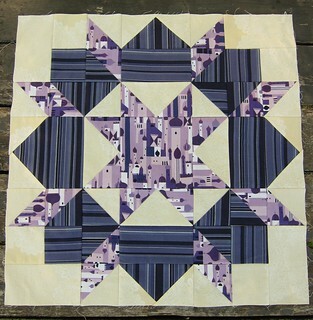 I even started sewing blocks together and then ripped them apart, moved things around and started again. I ended up with this and am glad I took the time to play with it until I was happy! I used my original inspiration to guide the layout. 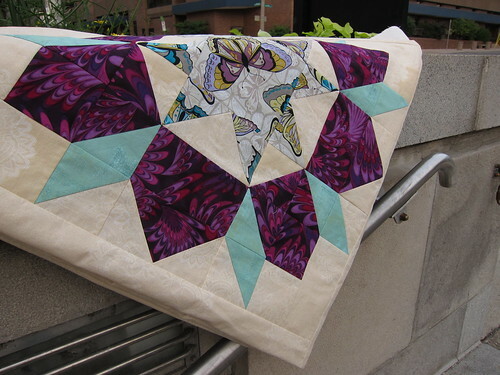 The block with the most vibrant purple was placed in the centre of the quilt as a focal point and the blocks with hints of green and lighter purple were placed in the four cardinal points to help move the eye around. Since I'm planning to use this quilt on a Queen sized bed and had tons of background fabric left, I decided to make a wider border to better frame the blocks. I settled on a 6.5" border all around. 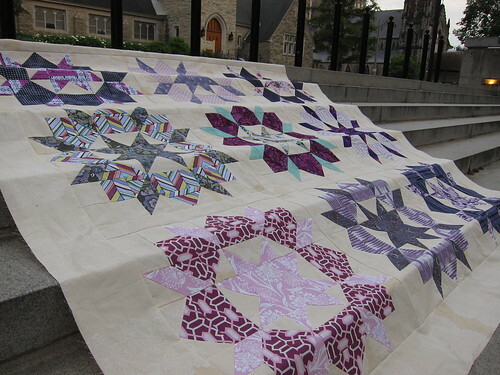 The finished quilt should end up at about 88" square. The background fabric I'm using is an old Anna Griffin print that has a lace scallop close to the selvedge. There is a significant colour difference between the lace scallop and background. 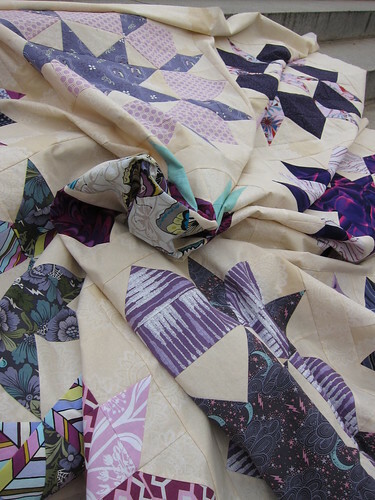 While assembling the sashing, I made an effort to stagger the WOF joins to distribute the darker portions of the fabric throughout the quilt top. 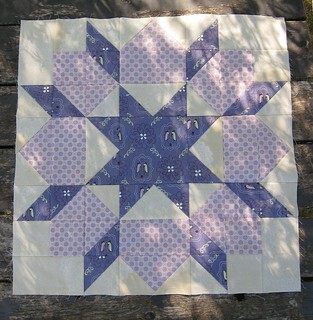 I'm working on my backing now and am aiming to get this basted sometime next week. Hope all of my American friends had a safe and happy 4th of July! I love how you designed your blocks. It is amazing what a difference it made in each one. 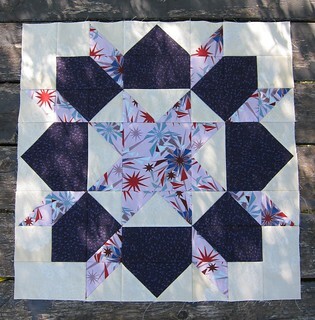 And then you picked the perfect block for the center. Great job! This is so pretty. 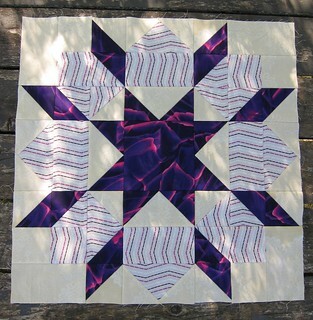 Purple is one of my favorite colors, but I haven't figured out how to use it effectively in my quilting. You did a beautiful job. Gorgeous! I think you found the perfect layout for the blocks - the eye does move around, just as you hoped. Great fabric choices! 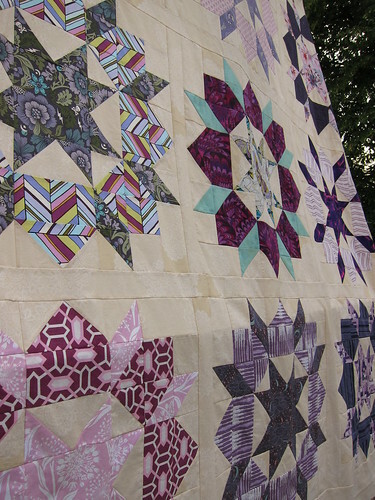 Love seeing everyones swoon quilts! Yours is lovely. It is just fabulous! What is the awesome multi-color stripe?